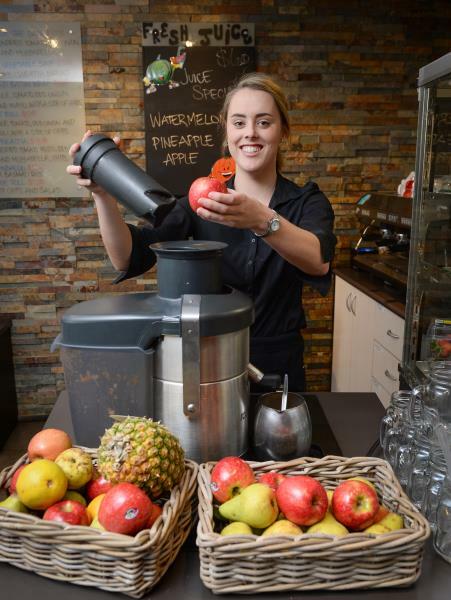 Sophie Webb whips up a juice at Club Cats' Players Bistro. Manager Luke Jacimovic invites guests to try the extensive range of fresh, hearty, quality meals for the whole family. Luke has also recently launched the club’s exclusive Players Juice Bar with changing daily specials to offer the perfect drink option. The bistro’s new summer lunch and dinner menus give patrons a wide range of choice from sandwiches and wraps for lunch right through to ever-popular steaks, seafood and Parmigianas. Customers can choose from three toppings to spice up their parmis, including: Hawaiian, with ham, pineapple, roasted capsicum and homemade barbecue sauce; Prosciutto, with tomato salsa, mozzarella, prosciutto and basil; and Traditional. The bistro offers a large gluten-free and vegetarian menu, which includes a popular chargrilled polenta and vegetable stack. All meals are made in-house with fresh local produce, supporting local producers such as Bannockburn Free Range chicken, Zeally Bay Sourdough and Lance, Lizzy and Leo’s local mussels, which can be enjoyed on their own or as a vital part in the bistro’s famous seafood chowder. Cats Hospitality also has four function spaces, some of which can cater for up to 400 guests for a cocktail-style dinner. It ideal for occasions such as weddings, work conferences and birthdays. The bistro is open from 9am Monday to Friday and from 10am weekends, with lunch from 11:30am to 2:30pm and dinner from 5:30pm to 8:30pm. Coffee and cake are available all day. Club Cats’ and the Players Bistro is open every day except Christmas at Simonds Stadium, phone 5225 2355. Previous articleCats ca$h grab: Will a quarter billion splash pay its way?